CHASING FOOD DREAMS: Philips Meaningful Innovation: Contribute One Idea, Improve Many Lives! 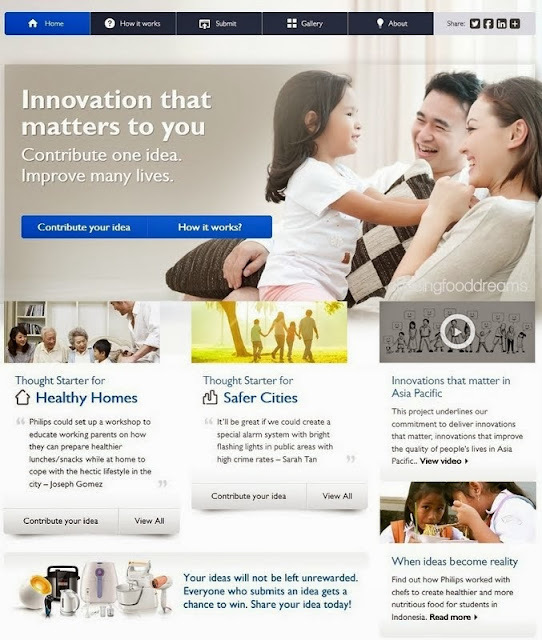 Philips Meaningful Innovation: Contribute One Idea, Improve Many Lives! It’s never too late to do our part for our world! After all, we only have one. Philips is proud to launch its new campaign of ‘Innovation That Matters To You’ where anyone and everyone can contribute their voice for a better world. 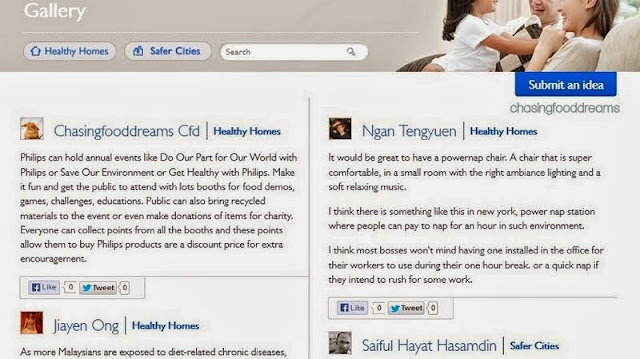 Simply submit your ideas and the winning one will be made into a reality by Philips in Malaysia! With all the current issues of environment, global health warning, safety of the world and more, Philips is doing their part to let the public have a say in improving the issues in the world by submitting meaningful innovation ideas. 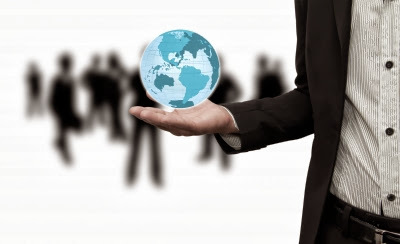 The motto of the campaign is to strive to make the world healthier and more sustainable through innovation. Philips even set a goal to improve the lives of 3 billion people a year by 2025. With this said, here’s how the mechanism works. It’s easy, it’s simple, submit your ideas and you may even win prizes if yours is selected as the final lists of 6. 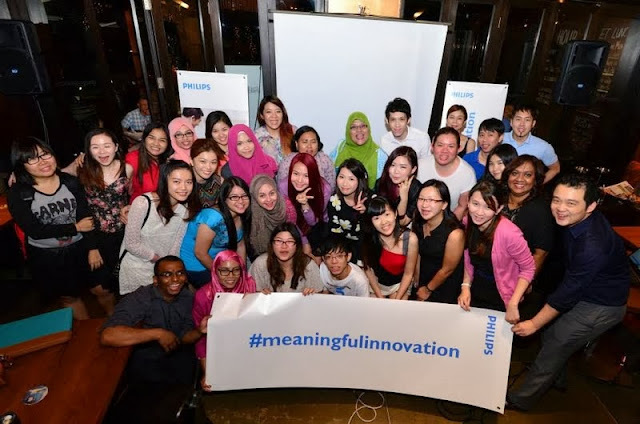 Check out Philips website for this campaign: http://www.meaningfulinnovation.asia/malaysia/. There are five tabs for five sections to explore. At the Home tab, there is a general summary and overview of campaign. 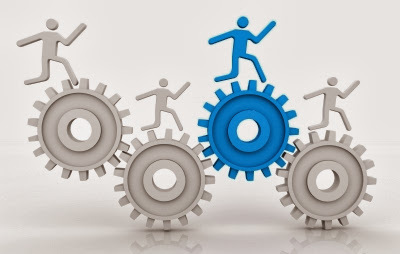 If you already know how it works, simply start contributing your idea. There are Two campaign sub themes to choose from, Healthy Homes and Safer Cities. Contribute your idea. If yours is deemed the top six, it will be shortlisted by Philips. From the six shortlisted, the public gets to decide which is the best and so get your family and friends to vote for your idea. Make sure to share your idea as much as you can to everyone. 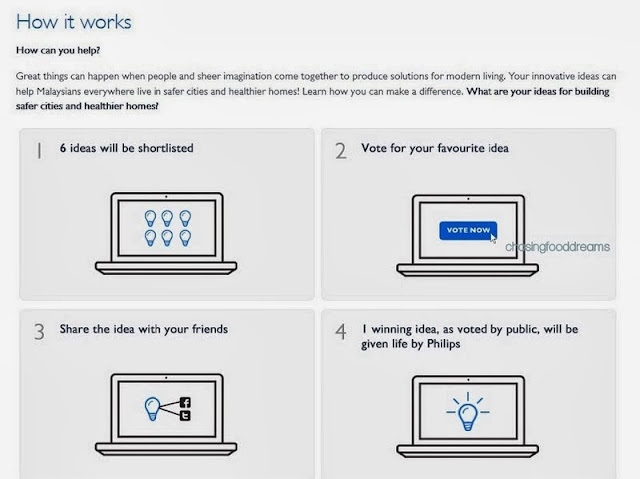 The final winning idea, as voted by public, will be brought to reality by Philips! Decide on your theme, or why not submit a few? Scroll down on the tab Submit to see this section. You need either a Facebook or Twitter account to login to enter this campaign. Login by clicking on the Facebook or Twitter button. Once you are login, simply type in your idea which is limited to 500 characters or less. Make sure to check the button to agree to the Terms & Conditions, fill in the Captcha code and click Submit. It would be great if Philips can hold annual events for public to come together to create awareness and do their part. There should be booths for education, food demostrations, games, challenges, competitions and more. At this event, there should be a corner for everyone to bring things to be recycled or donations from all to charity. 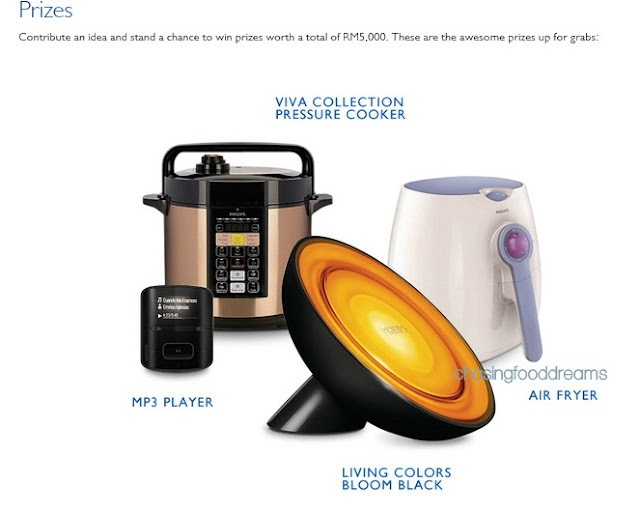 To encourage more attendees, everyone can collect points to be redeem towards purchasing Philips product at a discount price. With this idea, I believe it benefits everyone and the nation together with lots of fun added! After submitting your idea, you should get a confirmation by Philips on your submission. Double check your idea at the Gallery tab to make sure you can see your idea. That’s not all, here’s what you can take home if your idea is shortlisted to the final six! Get started at Philips with Innovation That Matters To You! No idea is too big or too small. All you need is to put on your thinking cap and get your idea submitted. I like the bright flashing lights alarm idea. I've been using their shaver for a long time now. Wahhhh!!!! So many bloggers...and only two look familiar, I think. Good luck to everyone taking part!